The aircraft is steered on the ground by use of the rudder pedals. It is almost certain that your first aircraft will be fitted with a steering nose wheel. 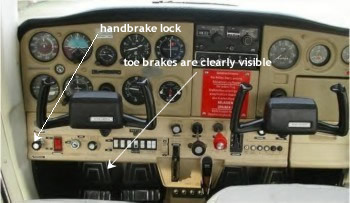 The linkage between the nose wheel and the rudder pedals disconnects automatically on take-off. 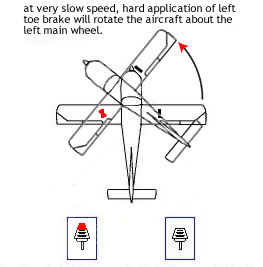 Application of left rudder pedal will cause the aircraft to turn left. Some folks find this confusing at first because they feel that it is the other way round to a bicycle handlebar; worse still for those who have done much sand or ice yachting as their steering is by foot pedals and opposite direction compared to aircraft. The aircraft is braked by application of the toe brakes. These are at the top of each pedal. In controlled airfields all aircraft movements must have ATC permission; nevertheless, ultimate responsibility remains always with the pilot. To get an aircraft to begin to roll, initial inertia must be overcome. Resistance will be greater on grass, This means that a greater amount of engine power is needed, that must be quickly reduced once rolling. Great care is needed as student pilots can easily forget the wings which can make contact with other aircraft or obstructions! The ground clearance between the moving propeller tips and the ground is not all that great. taxi slowly and avoid rough ground and potholes. When changing surfaces, say from tarmac to grass, approach at an angle to reduce any drop. Avoid long grass as you will be unable to see the surface underneath and the finish of the propeller can become abraded........ lawnmowers are much cheaper! Loose gravel can also cause a great deal of damage to the aircraft. After moving forward a few feet always give a dab of the brakes to confirm integrity. If a steering nose-wheel is fitted, it is impossible to check the operation of the rudder while the aircraft is stationary. This must be done once moving. Whilst taxiing you should also check for correct operation of the turn co-ordinator, attitude indicator, direction indicator and compass. You should not taxi with the fuel boost pump on in order to check for the correct operation of the mechanical fuel pump fitted to the engine. Taxi with the nose-wheel on the centre yellow line. Give way to the right, turn to the right if meeting an opposite direction aircraft and overtake on the left. Unless you are flying biplanes with low wing-loadings, wind is usually not a significant factor during the taxi. During the refuelling of an aircraft, all occupants must vacate. The aircraft brakes must be released so that in the event of fire the aircraft can be moved from the pumps.